Available in North America from retail outlets such as Amazon, Barnes & Noble. Distributed in North America by Ingram Publisher Services. John Barletta and Jan Bond are therapists in their own private practices in Brisbane, and the Gold Coast of Queensland, respectively. They have been colleagues and friends for many years and together are dedicated, through their individual work and collaborations like this publication, to providing the general public and clinical practitioners with the opportunity to better deal with life’s challenges. Since throwing myself back into the world of acting, my mental strength is one of my best assets. Sometimes we know what we need to do to fix ourselves, but we are not equipped with the right tools to do so; this book is my roaming toolbox. When dilemmas come across your path, big or small, it’s nice to have something to draw on and written in a way we can all take in. Do yourself a favour and keep a copy on hand. 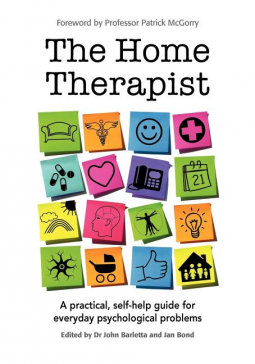 The Home Therapist offers a wonderful collection of practical and useful concepts and suggestions for leading a more healthy and fulfilled life. Clinicians and laypeople will find that this book will serve as a useful tool for everyday living. As I read from the many talented scholars in this book, I was reminded of what I often tell my graduate students in Counseling; you don’t have to be sick to get better. The Home Therapist is just the tool to aid so many in taking control of their own lives as they help themselves to a better life. I like the KISS principle, Keep It Simple Stupid, and this book is so easy to read because of the layperson terms, and these days it’s so hard to find information when you are in need that is so easy to read and understand. I strongly recommend it, even though I dislike reading. This book is a timely response to an ever increasing need for distilled wisdom that a collective of professionals present. I suspect it’s almost a pocket version of a Wikipedia for busy people used to getting all their information in one place. It would be hard to imagine a reader who would not find something of great value in this book. About time! Quality, well-researched professional information, brought together in an easy enlightening approach, across a wide range of common concerns—a triumphant first aid manual that will improve the wellbeing of all who use it.